Along the back of the heart gently pull on each side of a seam. 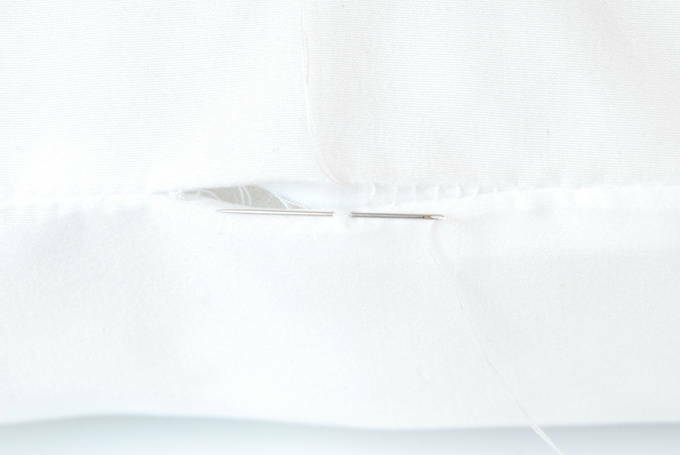 When you see a thick white thread holding the fabric together, clip it with a seam ripper. Then cut out the stitches all around to remove the back. Do this to both the pink and purple hearts. If you don’t have the stuffed hearts, print the Conversation Heart Pattern onto cardstock so the width is about 6¾ inches. Cut it out and trace around it on fabric of your choosing. Iron under a ¼ inch seam allowance. 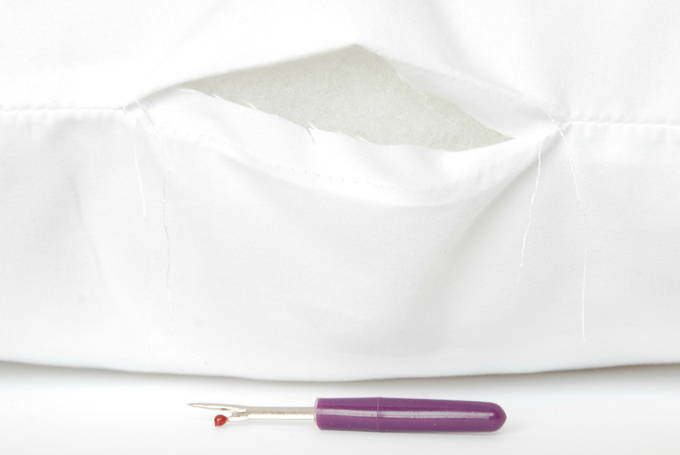 Using the seam ripper and the same technique as above, open up the side of the pillow where the manufacturers tag is. (This was a little harder to get open.) Just keep looking for a thread you can clip easily without damaging the pillow. But don’t clip every thread – just the very first two that hold it together. 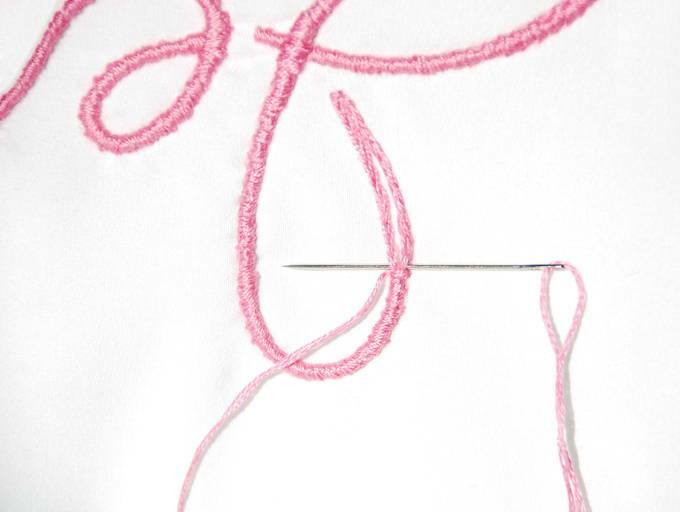 Once the two threads are cut, use the seam ripper tip (not the knife part) to undo the threads so they end up as long strings coming from each side. Do not cut them because we’ll need them later. Remove the tags. Make sure the opening is the width of your hand to get inside. NOTE: It wasn’t until I was all done that I noticed there was a little puckering around the name. I liked sewing it all from the outside. 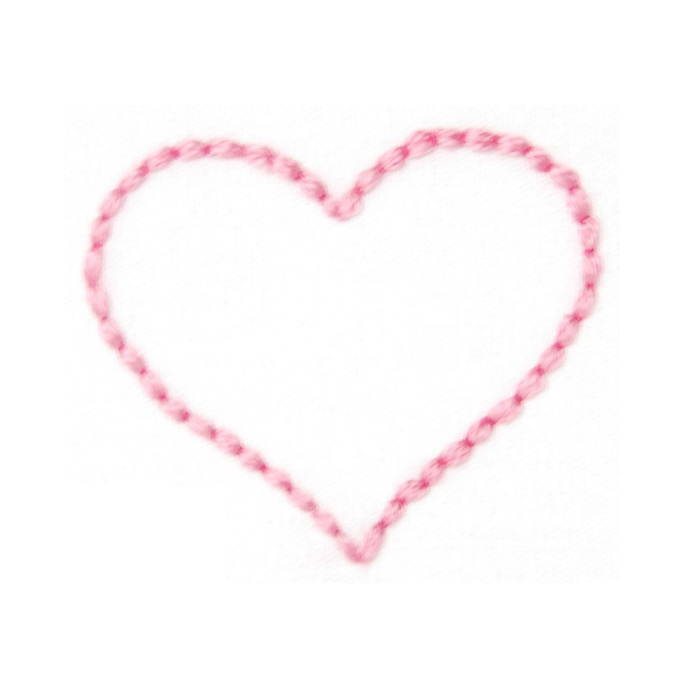 But if I made this again, I might try embroidering it using a hoop. But, this would involve opening the pillow up a lot more. Enlarge your child’s signature on a photocopier so it is about 3¼ to 3½ inches in height. Go over the writing with a black permanent marker so you can easily see it through the pillow. 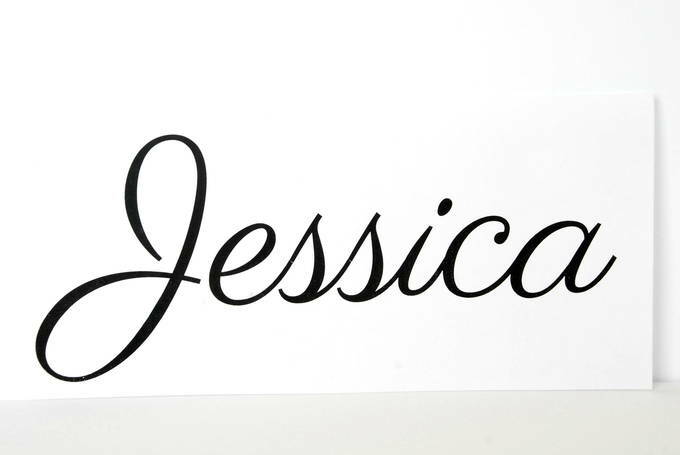 Or you can print the name using a beautiful font. I printed mine in the Parisienne font. It can be downloaded for free from www.1001fonts.com. I set the font size on my computer to 210%. Steam or carefully iron the pillow. 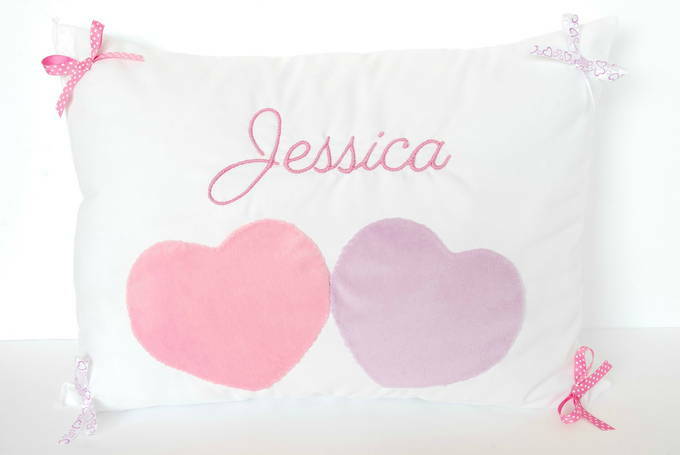 Gently slide the name inside the pillow. Then center and position it with a pair of long tongs. Position the hearts where you want them on the pillow. Make sure they’re perfectly centered – use a measuring tape to measure from the name and hearts to the edge on every side. Then measure again to be sure. Pin everything securely in place. Tuck the edges under the heart. 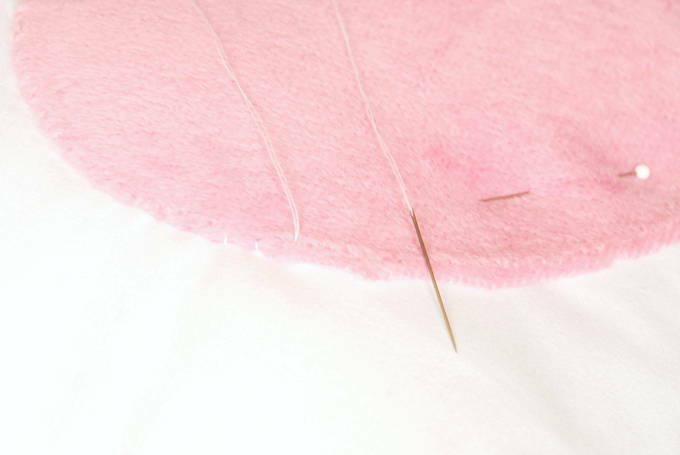 With white thread that is double threaded, slip stitch the edge of the hearts to the pillow using their holes as a guide. You can sew using their holes or just inside their holes if the seam allowance is thin. Try not to sew too deep so you don’t sew into the stuffing. 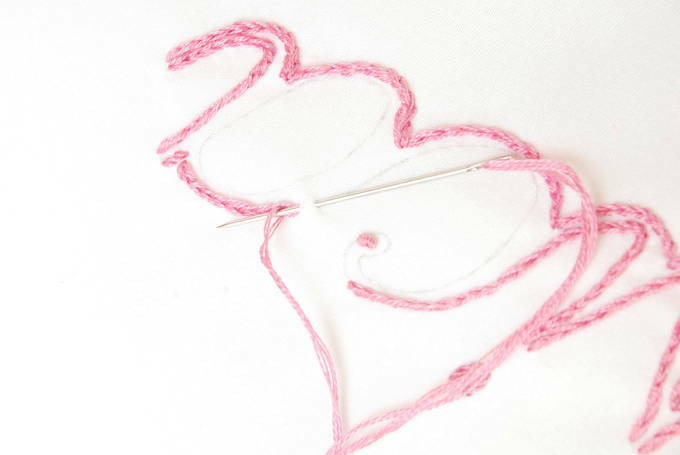 After each heart, reach in the pillow to gently pull the stuffing away from the stitches. 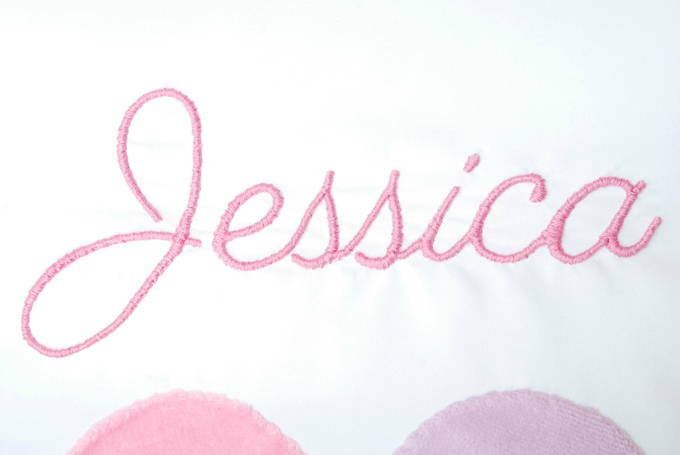 There are two ways you can embroider a name on the pillow. For both, trace the name using a fine tip pencil. When you’re done tracing, remove the paper from inside the pillow. 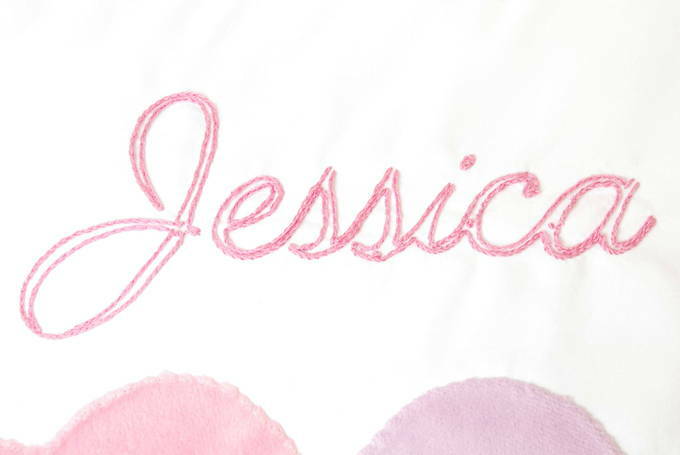 The more advanced method for a name with variations in its thickness involves using two embroidery stitches. Trace the outline of the signature. The split stitch is normally sewn using an embroidery hoop where you can have your needle on both side of the fabric. But if you don’t use a hoop, all sewing is done from the outside. To make the split stitch in this way follow the directions. Except when my needle came up I brought it up through the prior hole and then between the four strings. To get a good curve I sometimes made my stitches shorter in length. To reach the end of a letter I sometimes made a stitch longer. I ended with knots left in the widest parts of the letters. After every few letters, reach in the pillow to gently pull the stuffing away from the stitches. I used the satin stitch to fill it in with 3 strands of embroidery floss. But I didn’t go through the fabric on both sides of the split stitch outlines. Instead, I went across on top of the fabric along the very bottom of the split stitch outlines. Every once in a while I’d go through the fabric to make an edge look smoother. I spread out my threads to make them wide. I finished threads by pulling them through a finished letter before trimming. 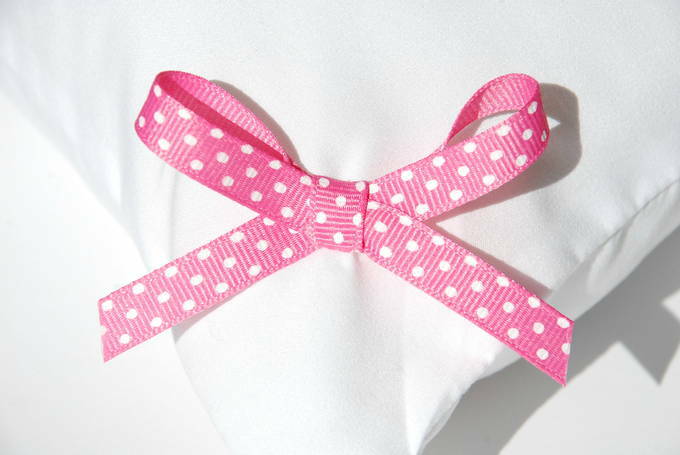 Make 2 bows out of each color ribbon. Their width should be about 2½ to 3”. Seal the raw ends by dabbing them with Tacky Glue™. Let dry. Then sew them inside the corners as shown in the photo. To sew the pillow opening back together, tie those long strings into a knot on each end to keep the sewn part of the pillow from coming apart. Keep the long knotted end strands intact and tuck them inside. Use a slip stitch with a doubled thread to sew the pillow closed. Begin sewing ½ inch before the opening so your stitches overlap with the original stitches. Do the same when you end, sew ½ inch beyond the opening. (This makes the closure stronger.) Try to sew in their holes so it looks like the original seam.